Voted! It was a challenge to pick just 10, but I eventually whittled it down. I've always thought this was a strong year for Safari, and it looks like most people agree! Two figures seem to by striding ahead of the pack, vying for first place. But there are only 24 votes so far, that could all change. Aaaaaand the Papo pulls ahead. Aaaand...now it's in 2nd again...! Man, y'all love them theropods. 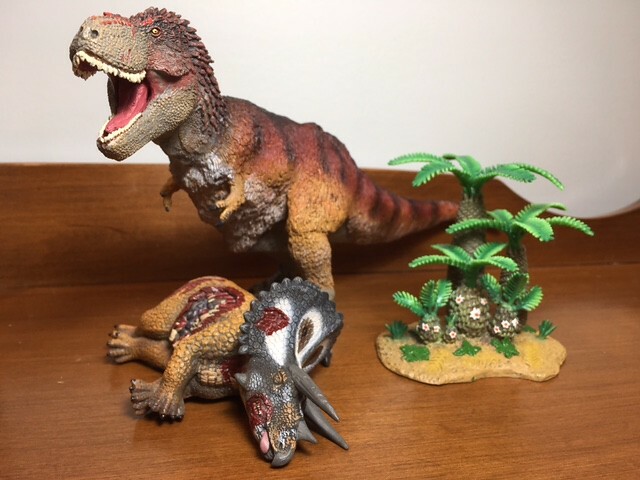 I'm surprised with the Papo Ceratosaurus many preferences and current second place, I would have thought it well behind other few much popular figures, such as some Safaris and a couple Collectas. But I think that in the end it'll be surpassed. Safari Ltd is dominating the poll so far. Although with Papo and CollectA in between some. I wonder how this will play out in the end. I'm not surprised the Safari Ltd Feathered Tyrannosaurus is in the lead though, so far. In any case, what a good year it was for figures, especially from Safari Ltd, Papo, and CollectA. I can't forget Eofauna with their Steppe Mammoth either. While I can't say the same for Rebor, I do rather like their Carnotaurus, and Deinonychus clan. I still want to get them down the road, unless more accurate (and hopefully cheaper) figures of those genus come out beforehand. And as if it wasn't tough for me to pick for this year's poll, 2018 is going to have one heck of an interesting poll, no doubt with the inclusion of Vitae's figures, the Beast of the Mesozoic figures, and all the exciting Safari Ltd, CollectA, and Papo releases. Even Schleich and Mojo have upped their game. Then there will also be the JW:FK line by Mattel as well. I would have voted for the CollectA Prehistoric Marine Tube, but since it was separated, I figured it would be better to vote for something else then a mix, or any one particular critter from it. I also regret not voting for the Eofauna Steppe Mammoth, but I kind of jumped the gun with voting, and missed it with all the choices present. That darn toob took up most of my votes! As a release the whole CollectA tube was a favorite. I really liked the Safari Coelophysis, since it changed the template for how the dinosaur should be seen. I voted for new ideas, while admitting there are many high quality implementations of dinosaurs. The Rebor Deinonychus trio shipped in January 2017, so if Rebor gets included I think they squeak in. At any rate they weren't included in the 2016 poll, so they probably deserve a shot. Would anyone vote for the following? I like Favorite Dioramas and the Burgess shale figures but they really are not available outside of Japan so most people do not know about them. One of the contenders is definitely pulling ahead of the rest of the pack. I don't understand how the WS Tyrannosaurus is so much ahead of the Velociraptor. In light of recent rediscussions about T-Rex integument you'd think that all people here concerned with accuracy would prefer the Velociraptor. T. rex integument remains an open discussion, not a settled case. And regardless of whether or not it really is scientifically accurate, it’s still a visually impressive and masterfully sculpted toy. Personally I think a scaly tyrannosaurus is more likely, and I got PNSO's masterpiece (imo) this year instead of Safari's masterpiece. The animals integument is still up for debate, and nobody can deny that the feathered Rex looks extremely cool. I can see why so many voted for it (myself included). ...that said, Wilson's eyes with the stock paint job were strange and unsettling. one of the first things I did with the model was repaint the eyes. If accuracy were the benchmark, Papo would generally not do as well as it does...they are artwork, but not exactly science-based. I remain reluctant to vote the Safari T. rex the top model when the first one I bought had to be returned because it wouldn't stand at all and its replacement requires gently propping up with its nose against the wall. It's a beautiful sculpt but stability counts for something, for me at least. I know others view things differently! everyone votes for different reasons. Some vote for scientific accuracy, some aesthetics, some for interesting species selection (that would be me), and some just vote for their favorite regardless of what it looks like. Personally I expected the CollectA supreme Dimorphodon to run away with it. *Chuckle* - Of course it winds up being a popularity contest, and a "good" overall figure that has been seen "in-hand" by the most people usually wins (looks like this year will be no different, judging by the standings above - but I digress). What this means is that the "best" figure (ie most accurate/artistic) almost NEVER actually wins, because that figure is usually on the more expensive end and has thus only been acquired by a small number of people. Popularity/sexiness of a species is a BIG factor too. I confess to having my own prejudices in this regard. I'll tell you a funny story about that - when Doug's Safari Iguanodon won a year or so ago, I was really left scratching my head. I felt like posting: "I know its a well-done, accurate sculpt - but people - its JUST an IGUANODON!! What were you thinking??!!??" OK. I've been biting my tongue, but you "opened the door", so I'll second your sentiment. While I haven't actually held it "in hand", from the myriad photos I've seen it seems to me that - in the mass-produced version at least - there is something off with the TEETH of this figure. Either they are too uniform, or they have been over-painted into the jaw ... or SOMETHING. The pose is also a bit too "squat" for me (I realize this is due to the need to balance it so it can stand on its own, a compromise, but one that also affects aesthetics. Finally - OK. I'll SAY IT. Its ... wait for it ... IMPOSSIBLY feathered. There is "0" (ZERO) , ZED, % chance that an actual Tyrannosaurus Rex had this level of feathering (unless there's an undiscovered sub-species that lived in the Arctic Circle). Wearing the saurian equivalent of a full FUR COAT in the Tropics is not something that evolution selects for. Ever. Animals in that size range lose their hair (see elephants, rhinos), UNLESS they live in a cold climate (Woolly Mammoth & Woolly Rhino). But its a pretty figure, its gonna win, and I really have no problems with that. It was Safari stepping out of its "comfort zone", and for that they should be commended. Hopefully that encoruages them to continue to "take chances". The more the merrier. While I agree that the feathering is more extensive than likely, I wouldn't call it impossible by any means. On a figure in this scale "thick" feathers are going to look identical to "loose" feathers that don't hug the animals contours and hang loosely covering its flanks without directly resting on them. Tyrannosaurus didn't live in a tropical environment, Hell Creek had seasonal temperature changes that most likely would have dropped below freezing in winter months.